Get healthy in an instant! These 100 recipes show how to use your Instant Pot® to make heart-healthy, fuss-free, delicious meals. The Instant Pot®—a pressure cooker that does the work of seven other appliances—has inspired home cooks with its versatility, speed, and consistently delicious results. And now, the American Heart Association offers the ultimate guide to using your Instant Pot® to support a heart-smart diet. Lean meats, whole grains, legumes, vegetables, and fruits transform into amazing meals in just minutes, and they'll leave you feeling great, too. 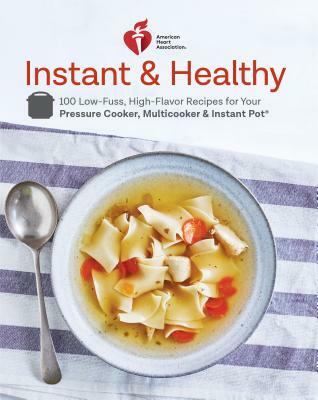 From appetizers to desserts and everything in between, the 100 recipes in American Heart Association Healthy Instant and Healthy will surprise you with their variety and depth of flavor. This cookbook includes more than 30 full-color photographs as well as easy-to-follow guides to using your Instant Pot® for ultimate health and flavor. The best way to ensure good food comes out of your cooker is to put only good-for-you ingredients into it, and with American Heart Association Healthy Instant and Healthy, you'll learn how much your pot can do for you while you're enjoying a healthy lifestyle. The mission of the American Heart Association is to build healthier lives, free of cardiovascular diseases and stroke. Its bestselling library of cookbooks includes Grill It, Braise It, Broil It; Healthy Slow Cooker Cookbook; Go Fresh; The Go Red for Women Cookbook; Low-Salt Cookbook, 4th Edition; and The New American Heart Association Cookbook, 9th Edition.